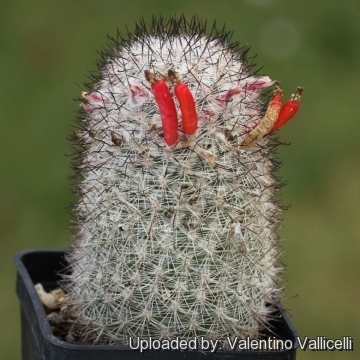 = Mammillaria slevinii (Britton & Rose) Boed. in Boed. Mammillarien-Vergleichs-Schluessel 44. 1933 Boed. Gray Herb. Card Cat., Issue 145. Origin and Habitat: Baja California Peninsula and various islands, Mexico. Altitude: 10 to 200 metres above sea level. Habitat: It grows on arid granite-based soils and rocky hillsides. 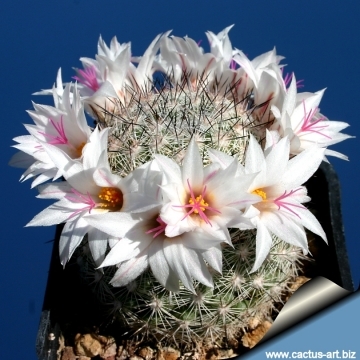 Mammillaria slevinii (Britton & Rose) Boed. in Boed. 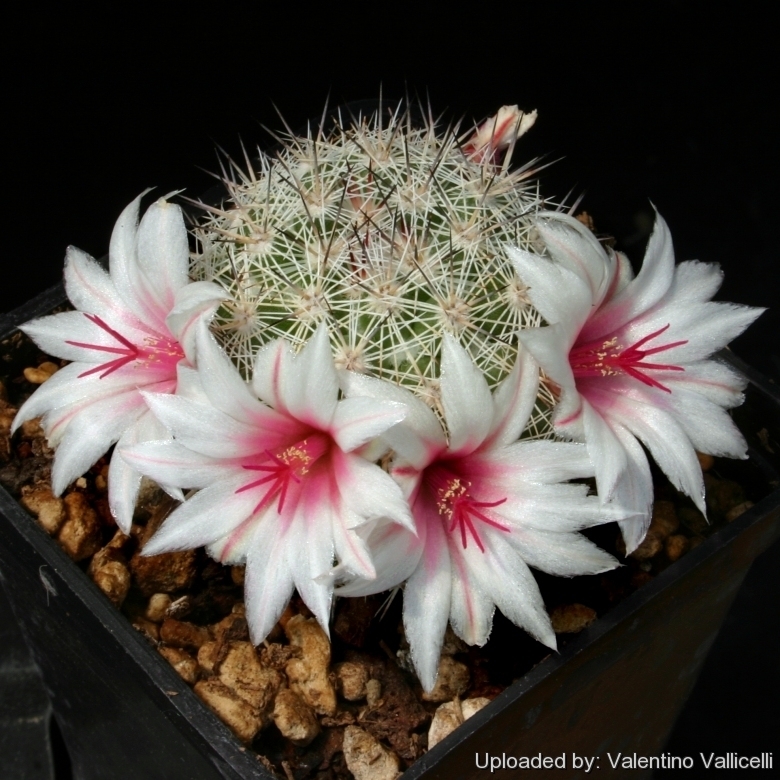 Mammillaria albicans f. slevinii (Britton & Rose) Neutel. 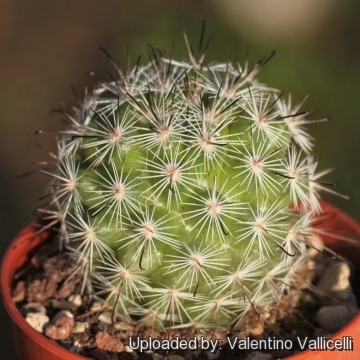 Description: Mammillaria slevinii is synonymous of Mammillaria albicans, they are are very similar, namely size and form of stems, shape of spines, flowers, etc. and the two plants are not readily distinguishable if not for the stems, simple or few branched (1-10 compared to 5-15 branched in M. albicans) moreover it has darker spines and the spine-areoles are not densely lanate. 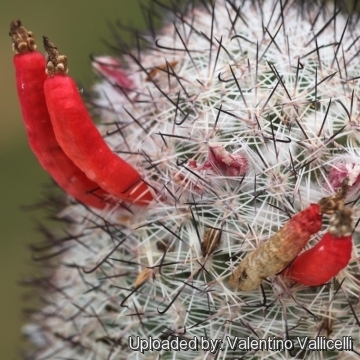 Habit: Solitary or clustering cylindrical cactus entirely hidden under the many closely set spines. Tubercles: Broadly conical, without latex. The axil is woolly, especially in the flowering zone and bears few bristles, white with dark brown tips. Spines: At top of plant pinkish below, with brown to blackish tips, on lower part of plant bleaching white. Central spines: About 6, , a little longer and stouter than the radials, slightly spreading, white with brown tips, 8-10 mm long. Radial spines: 14-21, white, 5 - 8 mm long. Flowers: Around the top, white to pale pink, with pinkish mid-veins, up to 20 mm in diameter. Outer perianth-segments with a pinkish mid-rib. Inner perianth-segments white. Filaments pinkish. Style nearly white; stigma-lobes nearly white to purplish. Blooming season: Summer (June to August). Fruits: Club-shaped, red, 10-18 mm long. Seeds: Nearly round, black, with a projection at base and a large basal hilum. Mammillaria albicans (Britton & Rose) A.Berger: produces clumps of 5-15 branches with cylindrical stems closely crowded and obscured by spines . Areoles densely white-woolly in youth. 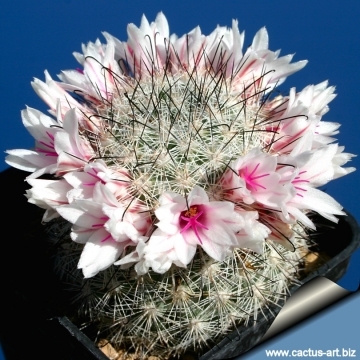 Mammillaria slevinii (Britton & Rose) Boed. in Boed. : has stems, simple or few branched, darker spines and the spine-areoles are not densely lanate. 5) León de la Luz, J.L., Hernández, H.M. & Gómez-Hinostrosa, C. 2013. 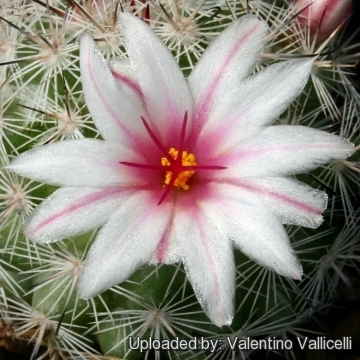 Mammillaria albicans. In: IUCN 2013. "IUCN Red List of Threatened Species." Version 2013.2. <www.iucnredlist.org>. Downloaded on 19 January 2014. 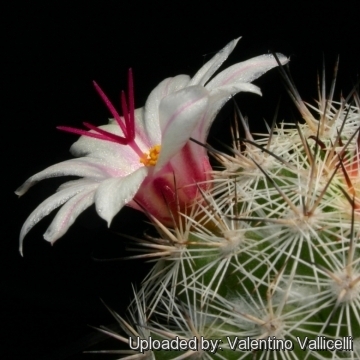 6 )Reppenhagen, W. "Die Gattung Mammillaria nach dem heutigen Stand meines Wissens" Frankenthal 1988 (1989). 7) Li Zhenyu. "Cactaceae." In: Ku Tsuechih, ed., Fl. Reipubl. Popularis Sin. 52(1): 272-285 1999. Cultivation and Propagation: It is slow-growing, and not especially easy to grow. Use pot with good drainage and a very porous mineral-based potting mix. Potted plants are quite wet-sensitive, especially in light of its small root system. Water sparingly during the growing season, keep very dry in winter. Feed with a high potassium fertilizer in summer. Usually it is recommended to overwinter this plant in a bright and warm greenhouse with at least 8-10° C, but it has proved to be quite frost resistant (if kept dry, it's hardy as low as -5° C). Strong light is required for flowering.